A massive megathrust earthquake off the coast of B.C. — along with a tsunami — is a near certainty, experts say, but nailing down when it will hit is impossible to predict. It could be centuries, in fact. A massive megathrust earthquake off the coast of B.C. — along with a tsunami — is a near certainty, experts say, but nailing down when it will hit is impossible to predict. It could be centuries, in fact. This powerful type of temblor was responsible for the devastation in the Indian Ocean in 2004 and Japan in 2011. "The odds of it happening today are small," says Simon Peacock, professor and dean of science at University of British Columbia, "but the odds of it happening in 500 years is incredibly high." There have been 19 similar events over the last 10,000 years, Peacock said, and the last time a megathrust earthquake struck off the West Coast was in 1700. However, they don't occur with regularity, so one could happen next year — or maybe not — for hundreds of years. 1. What is a megathrust earthquake? A megathrust earthquake is caused by a sudden slip along the fault between two tectonic plates when one has been forced under another. In the case of the West Coast, it is the Juan de Fuca plate that is moving eastward underneath the North America plate at a rate of a few centimetres per year. John Clague, Canada research chair in natural hazard research, said the motion is curling the edge of the North America plate upwards, much the same way a rug would buckle if you pushed on one edge. This puts a huge amount of strain on the fault until eventually, the North America plate "elastically bounces back," causing the earthquake and creating the tsunami, Clague said. The boundary between the Juan de Fuca and North America plate is called the Cascadia fault, which runs from the northern tip of Vancouver Island all the way down to the northern tip of California. 2. Which communities are most at risk? In the event of a megathrust earthquake, the whole area would first experience very strong ground shaking that could cause damage to infrastructure, and then a short time later, there would be be a tsunami, Peacock said. "It's a one-two punch," he said. 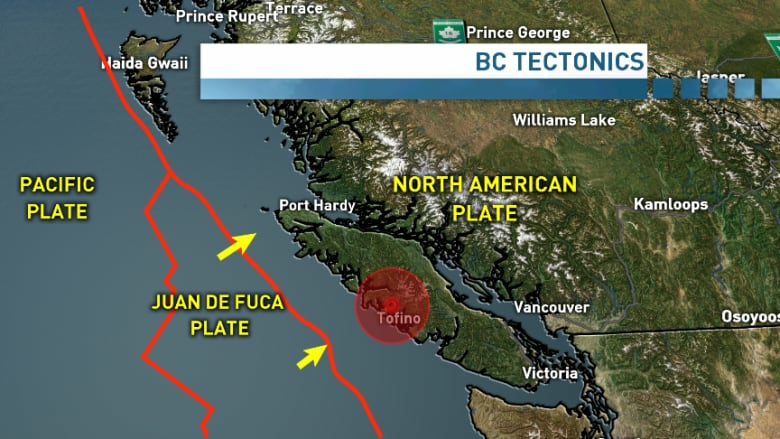 The western coast of Vancouver Island, including communities like Tofino, would bear the brunt of any large tsunami waves, which would form a natural barrier and help to shelter major population centres like Victoria and Vancouver. Clague said it's difficult to predict with any certainty but the west coast of Vancouver Island could experience tsunami waves between five and 10 metres high, possibly within 20 minutes of the event. Victoria could experience waves between three and five metres more than an hour later, and Vancouver could experience waves as high as one or two metres, Clague said. 3. How would people be warned? Alerting the public about the risk of a tsunami falls to Emergency Management BC, which receives information from the West Coast/Alaska Tsunami Warning Center in Palmer, Alaska. Officials determine if there is a tsunami risk and issue the appropriate warnings to various communities by contacting local emergency co-ordinators, first responders like police and fire, and local media. The actual business of ensuring news reaches individuals within affected communities depends on the emergency plan of each community, says Chris Duffy, executive director of operations and recovery transition with Emergency Management BC. This can include phone, email or fax messages, as well as sirens and even officials going door to door. Social media has also played an increasingly important role over the last few years, he said. Residents of affected communities would then head for specified higher ground or designated emergency shelters. Emergency Management BC says people should remain there until they are given the all-clear. 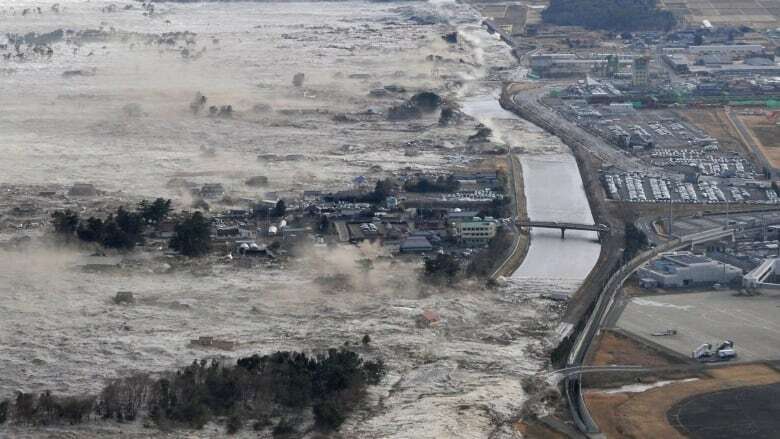 The first wave of a tsunami may not be the largest and several more could follow in the hours after an earthquake. Duffy said there is no one-size-fits-all approach to these evacuations, so it is important for people to be aware of their own community's plan. Emergency Management BC also urges person or family to have a specific plan and a store of emergency supplies, including food and water, that can last three days. In the event of a massive megathrust earthquake, the first warning signs would be the temblor itself. During the quake in 1700, scientists believe the area may have shaken for several minutes. That should be enough warning for people to start carrying out their individual plans, Duffy said. "If you're in an exposed coastal community and you feel the ground shake violently for a minute, don’t wait for a phone call from a government officer," Duffy said. "I mean, that is your alert."